Clissold park would have been built on in the 1880s if it weren't for a passionate campaign to preserve it for the public. The dramatic details came to light in 2016, 127 years after it opened. Stoke Newington history enthsiast Amir Dotan provides a fascinating glimpse into the saga. 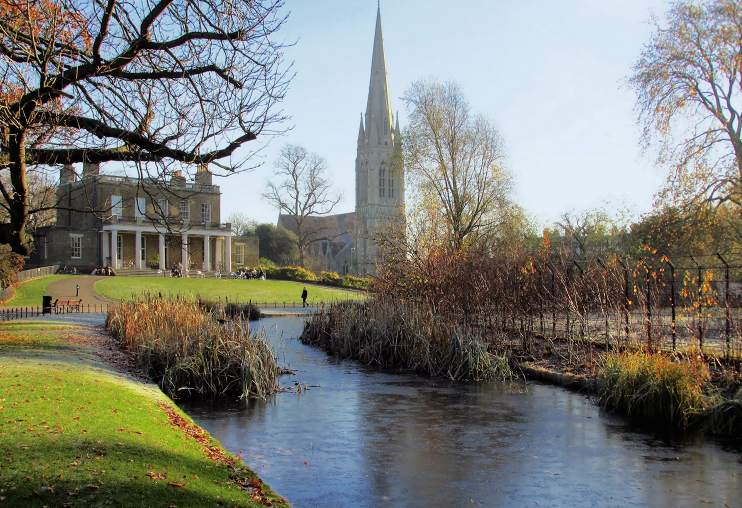 .Clissold Park in Stoke Newington is one of Hackney's most cherished open spaces. The original landscape was created in the early 1790s as the grounds of Paradise House (later renamed Clissold House, now Grade II), built for Jonathan Hoare, a city merchant, Quaker, philanthropist and anti-slavery campaigner. In 1884, the Ecclesiastical Commissioners bought the estate from George Crawshay with the intention of developing the site. The Clissold Park Preservation Committee, chaired by Joseph Beck, a manufacturing optician and local politician from Stoke Newington, fought for two years to secure its purchase 'for the recreation of the public forever'. Similar battles to preserve open spaces in the rapidly-expanding metropolis took place across London during this period. The campaigners, who included John Runtz, local politician and open spaces campaigner who was instrumental to the campaign's ultimate success, felt preserving the park would improve the health and well-being of people in the area. The park would also have economic benefits, as the area would become more desirable, resulting in increased value of houses and in turn an increase in the rateable value. By the early 1880s, all open spaces in Stoke Newington except Clissold Park were transformed into suburban streets. Like other social reformers, Beck was extremely concerned about losing green space where people, especially the poor, could relax in the fresh air. In January 2016, I was contacted by a descendant of Joseph Beck who infomed me of an extensive collection passed through the generations that records the campaign in fascinating detail. The meticulously documented letters, press clippings and posters tell the riveting story of how the campaign developed with heated meetings, a 12,000-strong petition and numerous articles in the press, and how its success hung on a thread throughout. The asking price for the land was £96,000 (about £11,000,000 in today's money). The committee secured £72,500 from the Charity Commissioners and the Metropolitan Board of Works; but to purchase the in its entirety, the rest of the money had to be raised from local parishes. Each was offered a 50-year loan (probably by the Metropolitan Board of Works), which meant a fractional increase to the amount ratepayers paid (similar to today's council tax). This important fact was either not known or ignored, as those opposing the purchase plan continuously cited the significant amount as a reason for not contributing. Sir, The Clissold-park swamp and swindle is re-started, this time with only half a nibble, £5,000 in lieu of £10,000. Does anyone suppose that, if we once let these vermin gorge on our Islington cheese, that they wilt cease scooping it out? They would be sure to ask for more. One might think people would be willing to pay to preserve 53 acres of open space on their doorstep. In reality, there was fierce opposition, mainly in Islington and Hackney, where locals felt they shouldn't contribute to the purchase of a park outside the boundaries of their parish, that the money could be better spent and Finsbury Park was close enough. Islington was originally asked to contribute £10,000, which reduced to £5,000 and then £2,500. Hackney agreed to pay £5,000. Stoke Newington contributed £10,000 and South Hornsey £46,000. Finally, in the summer of 1888 the Metropolitan Board of Works purchased the park. It opened officially on July 24 1889 and people from all around the area have been enjoying it ever since. © David Holt, Attribution 2.0 Generic licence. Colour-coded planning map. Apparently sent to Joseph Beck in 1884 by the landowner George Crawshay, who considered selling part of the park for development and keeping the area on the bottom left as a public park. Historical images courtesy Joseph Beck's Clissold Park Preservation Committee archive.